132 documentary proposals from 18 countries competed for the 2004 awards from the Alter-Ciné Foundation. Our successful fundraising allowed us to grant three awards. 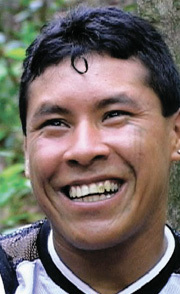 KUMARE TXICAO, 27, of the Ikpeng indigenous nation in Brazil, received US$10,000 for his project, “The Day I Saw the White Man”. Our seven-member jury found that Kumare's project captures a crucial moment in the Ikpeng's struggle to win back their ancestral land. His story, told with a mixture of sadness and humour, presents "the other side" of history, an indigenous filmmaker telling the story of his own people. Whites first made contact with the Ikpeng in 1965. There were only about a hundred Ikpeng left at the time, living on the banks of the Jatoba River in Mato Grosso state. Forty years after this fateful encounter, Ikpeng elders still remember clearly what happened. They talk with a longing for the time before they were "discovered" and lived totally by their own means on their own land. Kumare's film will be the Ikpeng's first opportunity to tell their own story, to make the rest of us understand the dramatic importance of that first meeting with whites. For once, whites represent "the other", a much needed twist in documentary filmmaking. HECTOR GALVEZ and CARLOS CARDENAS, from Peru received US$ 5,000 for their project “Lucanamarca”. Our jury was impressed by the courage of the two filmmakers whose story from the Sendero Luminoso rebellion is a rare attempt to break through the silence surrounding this dark chapter of Peru's history. Hector and Carlos are not looking for heroes and villains; their aim is to show us how deep this conflict cut into Peruvian society and why reconciliation is so difficult. High in the Andes, the village of Santiago de Lucanamarca was one of the first to feel the brutality of this undeclared civil war. On 3 April 1983, 69 ordinary villagers - men, women and children - were killed by guerrillas of the Sendero Luminoso movement. Twenty years later, a team from Peru's Truth and Reconciliation Commission has arrived in the village to exhume the bodies. Little by little, survivors begin to remember, and the painful story of the massacre takes shape. The wounds are still open; the people still have to come to terms with what happened. Renate Costa, winner of one of the 2004 Alter-Ciné Foundation awards. RENATE COSTA, 23, from Paraguay, also received US$ 5,000 for her project “Cuchillo de palo” (Knife of Wood). Our jury was impressed by the originality in Renate's treatment and her cinematic writing. Hers is a political and personal story from the period when homosexuals in Paraguay were put on a "black list" by the Stroessner regime, and many paid with their lives.